Portland, OR—GreenDrop Recycling and Composting Stations, from Pacific Cascade Corporation, are now helping Elephants Delicatessen to further reduce landfill contributions while increasing public awareness. Elephants understands how small efforts to reduce, reuse, and recycle can make a significant impact, benefiting community and the environment. GreenDrop Recycling Station at the Flying Elephants Delicatessen in the Portland International Airport. Elephants has been a leader in sustainable practices; purchasing 100% of their electricity from renewable resources, as a pioneering member of Portland Composts!, and a Metro Recycle Works participant. Elephants has made great strides in reducing their environmental footprint, and wanted to do more. 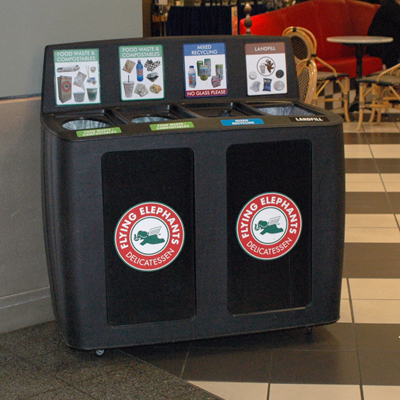 Now Elephants has deployed GreenDrop Recycling and Composting Stations at their retail sites so customers can more easily help reduce landfill waste. GreenDrop Recycling Stations reduce landfill contributions by users quickly self-sorting recyclable and compostable items out of the waste stream. “Throughout our company, employees know our Green Statement and our recycling process, but our customers don’t always know how to participate. For example, we use biodegradable and compostable packaging and service ware. Our utensils, bags, plates, coffee cups, and more can all be composted”, said Anne Weaver, CEO of Elephants. Each GreenDrop station has four individual bins. Customized to fit the waste needs at individual locations or consistent throughout a large venue. Elephants provide customers the options of Composting, Glass Recycling, Comingled Recycling, and Trash (Landfill). Customers are guided by graphic instruction labels so they can quickly and easily sort their waste into the correct bins. “We saw the GreenDrop Stations in use at the Rose Garden, where the Portland Trail Blazers play, and thought it was the perfect solution for our needs,” explains Elaine Rhine Tanzer, Elephants Delicatessen’s Founder. “We currently prevent over 1000 pounds of food waste and soiled paper from entering our landfills each week, by composting all our kitchen waste. We know we can dramatically increase those numbers with the GreenDrop stations”, added Russell Spees, Director of Operations for the Flying Elephants locations. “We’ve invested extensive energy and research to be as eco-friendly as possible. 90% of food packaging at our Flying Elephants stores is fully compostable. We have salad containers that are 100% petroleum free and made from corn products. We don’t want those items filling up landfills”. The unique, market-leading GreenDrop Recycling Station was designed through multi-year efforts of the Portland Trail Blazers head office and the Rose Quarter. Their landfill diversion rate increased from 38% in 2007 to 90% in 2011, in part by replacing old-style garbage cans with GreenDrop Recycling Stations. 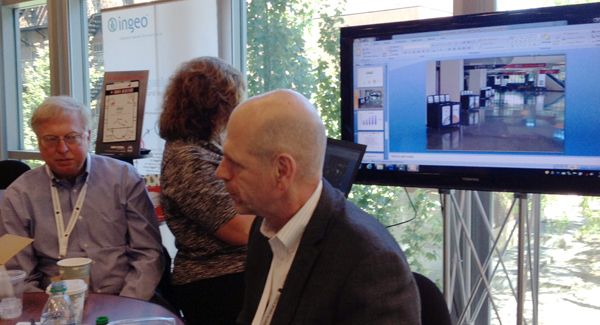 GreenDrop stations reduce landfill contributions by visually guiding users to properly dispose recyclable items. GreenDrops are a key tool in reducing a venue’s environmental footprint through fiscally responsible sustainable operations. GreenDrop Recycling Stations are a proven asset when investing in facilities operations and public perception. Contact us to discuss how GreenDrop stations can enhance your recycling/composting program. Since 1987, Pacific Cascade has been providing the Parking, Hospitality, Traffic Enforcement, and recently the Environmental Sustainability Industries with products to manage and support their effective operational needs. Los Angeles, CA (January 16, 2013)—GreenDrop Recycling Stations are an instrumental part of the recycling program at STAPLES Center, the home of the the NBA’s Los Angeles Lakers and Los Angeles Clippers, the Los Angeles Kings and the WNBA’s Los Angeles Sparks. 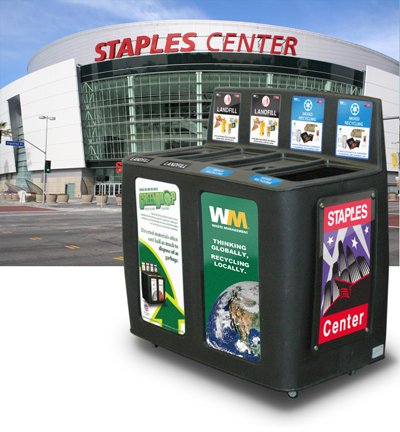 AEG (Anschutz Entertainment Group) manages the operations at STAPLES Center and as part of their environmental and sustainability programs, they have partnered with Waste Management to increases recycling efforts and decreases the amount of waste going to landfills. AEG and Waste Management have selected the GreenDrop Stations from Pacific Cascade Corporation to assist with the recycling program at STAPLES Ceenter. GreenDrop Recycling Stations reduce landfill contributions by users easily self-sorting recyclable and compostable items out of the landfill waste stream. Reducing their environmental footprint while minimizing expenses and being fiscally responsible through sustainable operations. The unique, market-leading GreenDrop Recycling Station was designed through multi-year efforts of the Portland Trail Blazers head office and the Rose Garden Arena. The arena’s landfill diversion rate increased from 38% in 2007 to 90% in 2011, in part by replacing old-style garbage cans with GreenDrop Recycling Stations. GreenDrop stations reduce landfill contributions by visually guiding users to properly dispose recyclable items. GreenDrops are a key tool in reducing a venue’s environmental footprint through fiscally responsible sustainable operations. Each year, the OGA asks for nominations for greatness in Golf Courses, Country Clubs, Resorts and other golf facilities and this year they recognized Royal Oaks Country Club in Vancouver, WA, for their commitment to being environmentally conscious, and giving back to the community. 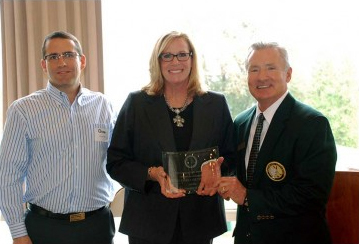 The honor was awarded to Club Manager Marcia LaFond by Oregon Golf Association President Mark Reed at the 2012 OGA Annual Awards Meeting. (left to right) Doug Palin the President of Royal Oaks, Royal Oaks Country Club Manager Marcia LaFond, and Oregon Golf Association President Mark Reed. 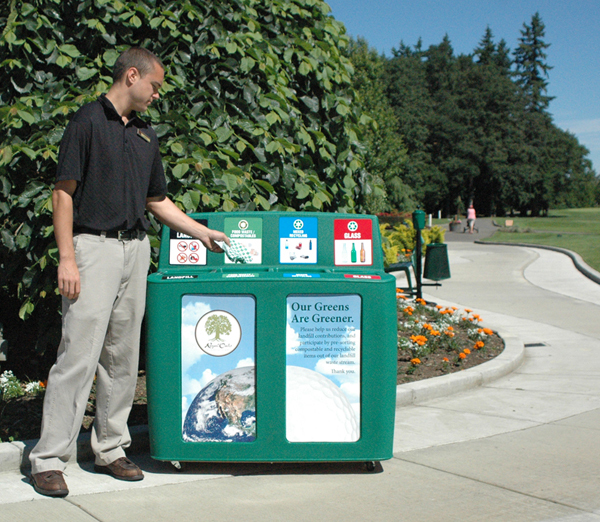 Royal Oaks is the first golf Club in the country to deploy GreenDrop Recycling Stations. The club also hosts several annual events that raise much needed funds for local non-profit organizations. GreenDrop Recycling Stations reduce landfill waste by users easily self-sorting recyclable and compostable items. This results in a drastic reduction of their environmental footprint while minimizing expenses and being fiscally responsible through sustainable operations. Other notable GreenDrop venues include, the Rose Garden Arena, home of the NBA Portland Trail Blazers, BBVA Compass Stadium, the new home of the MLS Houston Dynamo and Staples Center in Los Angeles, home of the NBA Los Angeles Lakers and Los Angeles Clippers along with the NHL Los Angeles Kings. In addition to their environmental commitment, Royal Oaks shows their commitment to the community. They raise over $20,000 annually for local military families during the annual American Turkey Shoot Event that has raised more than $150,000 over the past seven years. Royal Oaks also has raised $10,000 for the Vancouver Chapter of the American Heart Association and provide two Clark County area high school students with membership to Royal Oaks, giving them full access to the course, facility & staff to work hard at golf while recognizing their hard work academically. 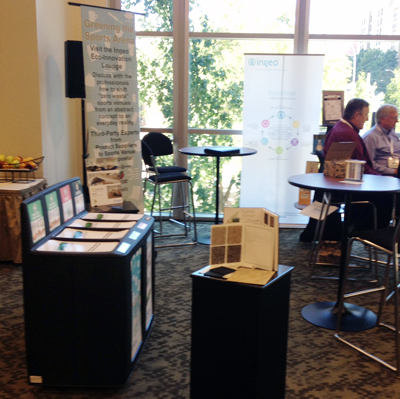 The GreenDrop Recycling Station is also a featured element in the Ingeo Eco-Lounge hosted by NatureWorks. The Eco-Lounge is where Third Party Experts discuss how to shift “zero waste” sports venues from an abstract concept to an everyday reality. The expert speakers represent International Paper, Fabri-Kal, the Pittsburgh Pirates, AgRecycle, StalkMarket and the Rose Quarter, home of the Portland Trail Blazers, where they have used the GreenDrop station since 2008. The Rose Quarter went from a 38% Landfill Diversion Rate to a 90% in 2011. 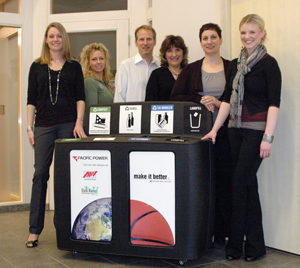 The unique GreenDrop Recycling Station was designed through the efforts of the Portland Trail Blazers Head Office to reduce their environmental footprint while minimizing expenses and being fiscally responsible through sustainable operations. Extensive research, including a university study, took place in developing the GreenDrop Stations by observing public habits and interaction to various recycling configurations. The result was an ADA conforming, four compartment unit made of recycled plastic that allows users to send food, drinks and compostable plates, cups and utensils to a composter instead of a landfill, while separating recyclable items as well. The monitor shows the placement of the GreenDrop Recycling Stations within the Rose Quarter, the home of the Portland Trail Blazers. Vancouver, WA (July 10, 2012) – GreenDrop Recycling Stations are showing up in all the right places. Royal Oaks Country Club is the first golf course to take advantage of GreenDrop Recycling Stations. They chose GreenDrop Stations to reduce their environmental impact footprint. The Green Drop Stations reinforce Royal Oaks’ eco-conscience effort to increase recycling and composting initiatives as well as landfill diversion rates within their club. GreenDrop Recycling Stations reduces landfill contributions by making it easy to self-sort recyclable and compostable items out of the landfill waste stream. This results in a drastic reduction of the environmental footprint and minimizes expense by being fiscally responsible through sustainable operations. Royal Oaks has been a member of the Audubon Cooperative Sanctuary Program (ACSP) since 1989. The ACSP is a partnership between the United States Golf Association (USGA) and Audubon International. The ACSP works with golf courses to help develop a custom program that focuses on being environmentally conscious of the local water sources, wildlife species and native habitats. The market-leading GreenDrop Recycling Station was designed through multi-year efforts of the Portland Trail Blazers head office and the Rose Garden Arena. The arena’s landfill diversion rate increased from 38% in 2007 to 90% in 2011 in large part due to replacing their old-style garbage cans with GreenDrop Recycling Stations. GreenDrop Stations reduce landfill contributions by visually guiding people to properly dispose recyclable items. Royal Oaks Country Club is a member-owned club located in the heart of Vancouver, WA. Royal Oaks is consistently rated as one of the top five golf courses in the state of Washington by Golf Digest. They are a traditional, championship style course that embodies everything that’s special about the Northwest. The beautiful fairways are lined with towering trees and the greens are renowned for their speed, firmness and pure roll. Take a tour at RoyalOaks.net. Celebrating its 25th anniversary, Pacific Cascade has been providing the Parking, Hospitality, Traffic Enforcement, and recently the Environmental Sustainability Industries with products to manage and support their effective operational needs. GreenDrop Recycling Stations® Score Big in Houston. GreenDrop Recycling Stations team up with the MLS Houston Dynamo. Houston, TX (May 21, 2012)—GreenDrop Recycling Stations are an instrumental part of the recycling program at BBVA Compass Stadium, the new home of the MLS Houston Dynamo. As part of the “Building a Better Houston” campaign, BBVA Compass has partnered with Greenstar Recycling to develop “Building a Better Planet,”which increases recycling efforts and decreases the amount of waste going to landfills. 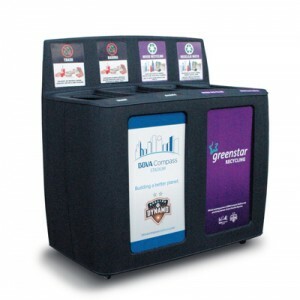 Greenstar Recycling, the Houston Dynamo, and BBVA Compass Stadium have selected the GreenDrop Stations to assist with the recycling program at the stadium. The unique GreenDrop Recycling Station was designed through multi-year efforts of the Portland Trail Blazers head office and the Rose Garden Arena. The arena’s landfill diversion rate increased from 38% in 2007 to 90% in 2011, in part by replacing old-style garbage cans with GreenDrop Recycling Stations. GreenDrop stations reduce landfill contributions by visually guiding users to properly dispose recyclable items. GreenDrops are a key tool in reducing a venue’s environmental footprint through fiscally responsible sustainable operations. American Idol contestant Britnee Kellogg (far right) stopped by Pacific Cascade Corporation and had a quick photo with some of the staff. Pacific Cascade is the parent company of GreenDrop Recycling Stations, and the ParkingZone. Britnee works for Regents Bank with whom Pacific Cascade does it’s banking. Pictured are (l. to r.) Lori Atkins, Annette Ritola, Mark Curtis, Sandy Prue, deanna meyer, and Britnee Kellogg.